Why is the CFSP an anomaly in treaty terms? As described above, most areas where the EU can act (both shared and exclusive competences) are outlined in the TFEU, but because of the difficulty of enshrining this politically sensitive area of shared competency between the EU and member states, its provisions are described in the TEU rather than the TFEU. It is in effect, however, a shared area of competence. All a bit confusing? It helps to think of the Lisbon treaty as a document that modified the EU’s previous three pillar set-up into two treaties – the Treaty on European Union (TEU) (the same as we saw above – albeit with some modifications) and the Treaty on the Functioning of the European Union (a renaming of the old TEC that now incorporates most of the police and judicial cooperation that used to fall under the third pillar (see diagram below). 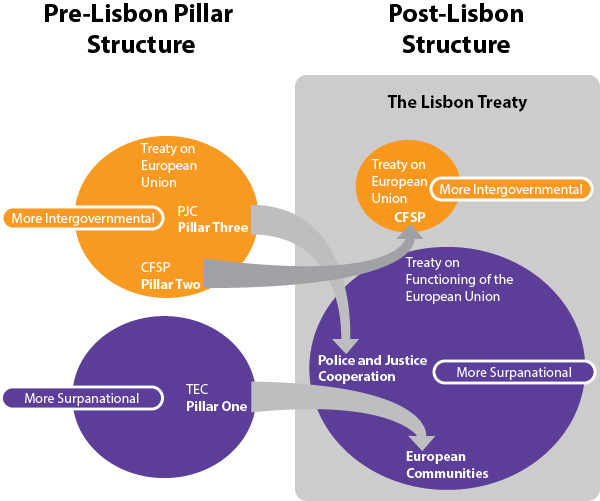 It could be argued that the new set up after Lisbon is really a two pillar structure with the TFEU providing the first pillar and the TEU (particularly with the provisions on CFSP) providing the second pillar. This ‘two pillar’ terminology is not very often used however.